Sometimes we just want everything to work out. We look at the messiness around us and hope that it could be better. This has been our story for thousands of years. So the ancient Greeks set about to fix this by pursuing the value of perfection. In sculpture, they created near-perfect likenesses of near perfect human figures. In society they sought to create perfect sets of laws and governments. They developed philosophy, mathematics, and even religion around the ideal of perfection. The goal of the human life was to achieve more than mere excellence, humans were to aspire to perfection. This ideal has been passed down through the ages, from master painters, musicians, and physicists, we have found that the way of perfection is alluring. We have created stunning masterpieces and always aim higher. Yet there is a darker side to the ideals of perfection. We often discover that the places and people around us are not perfect at all. We look at our own lives and realize that we have to hide or cover up our imperfection because we simply do not know how to get better, stronger, younger, or faster. Still we demand perfection in others, in our government, our schools, and our own relationships and soon find ourselves stuck, frustrated and angry. Is perfection the right goal? There is another approach that says that between each person exists the potential for flourishing life. Between two imperfect people it is possible to create something called, ‘goodness.’ Goodness can come out of a bad situation, it isn’t glossy or clean, yet it is always a possibility, regardless of the circumstances. We can choose goodness and create an environment for goodness whether we are experiencing joy or sorrow, and every relationship in every place can become host to goodness. Goodness might not be as slick as perfection, but in some ways it might be even more rare, and much more beautiful. When the world is messy and absurd, perfection may not be the solution. Trying harder, looking better, and keeping up with the Joneses does not solve very much in the end. However bringing goodness to the space between us and others can bring life in ways that we might never expect. 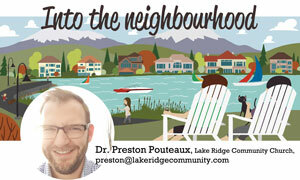 Our neighbourhoods might look nice, and may even strive towards a kind of perfect idealism. But our true joy may never be found in the perfection we build, but in the goodness we create together. When we set about to create a place where imperfect people can participate in creating a good place to live, play, work, worship, and connect, we may discover something surprising. Along the way we may find that what we’re looking for all along could be found in the the least perfect place: the space between you and your neighbour. What good thing in your neighbourhood could you cheer along this week?